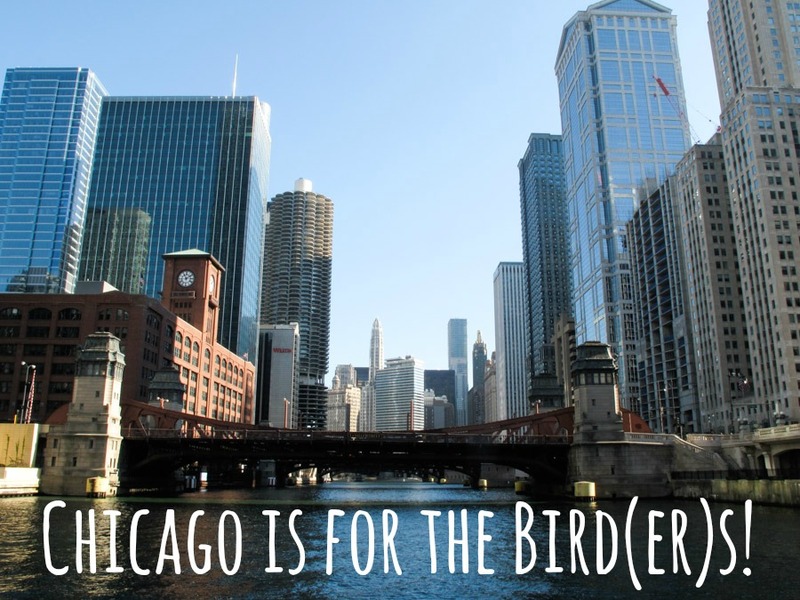 Chicago Is for the Bird(er)s! As nature photographers and hiking enthusiasts, we are often bemoaning the fact that we live in Chicago. Now, don’t get us wrong. Chicago is an amazing city with tons of fantastic cultural offerings at our fingertips. But as far as hiking and wildlife opportunities go, we’ve always found it to be lacking. With skyscrapers providing the only change of elevation and pigeons being the predominant fauna, this urban setting is a little less than ideal in the nature department. So, you can understand when we say that it was a pretty mind-blowing experience when we somewhat randomly discovered a few weekends ago that we’ve been living less than ten minutes away from a bird watcher’s mecca at Montrose Point for the past twenty years, yet we’d never really taken advantage of it. Montrose Point is a legendary birdwatching spot on Chicago’s north side. 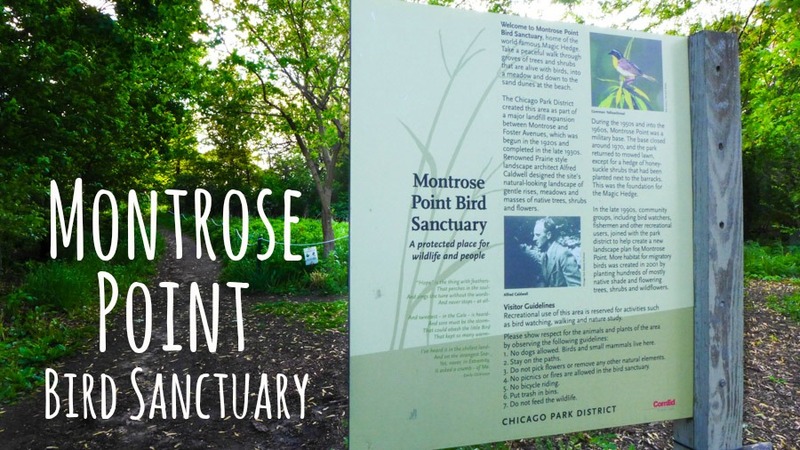 Located on park district property east of Lake Shore Drive, Montrose Point comprises a variety of attractive bird habitats in a relatively small area, including lakeshore, dunes, prairie, and woodland. The point juts out into Lake Michigan and, during fall and spring migrations, provides an ideal resting spot for birds making the big journey across Lake Michigan. The focal point for most birders here is the “Magic Hedge,” a series of densely-packed flowering trees and honeysuckle bushes that provide food and shelter for the migrants. The hedge was planted in the 1950’s as landscaping around barracks when Montrose Point was a military base of all things. The barracks are long gone, but the hedge has remained, and the whole area has been landscaped with native plants and trees to attract birds. 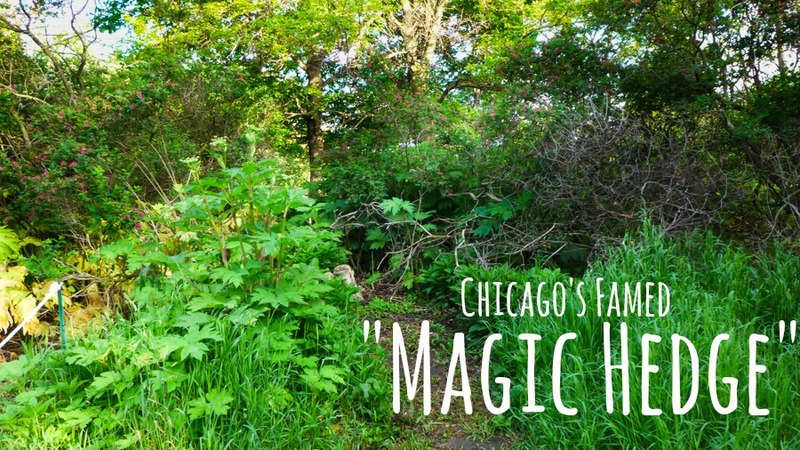 We had actually heard about the Magic Hedge long ago when we first joined the now defunct Nature Camera Club of Chicago. We had even hiked past it on the trails criss-crossing Montrose Point in our efforts to get in shape for some of our backpacking adventures, but we had never been there at the right time of day or year and kind of wondered what all of the fuss was about. We probably wouldn’t have discovered its potential again this year if it hadn’t been for an email sent to us in mid-May by a very talented photographer in our current camera club encouraging everyone to head out the following morning to Montrose Point. 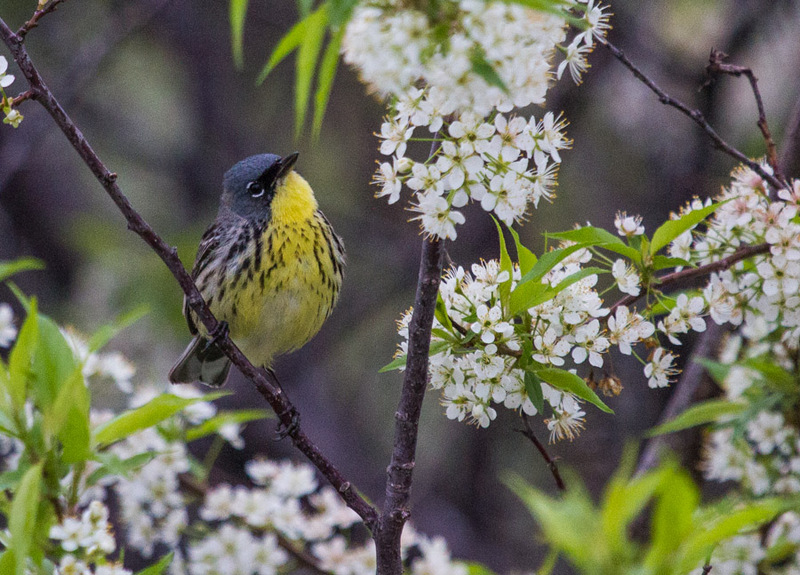 It was the peak of spring warbler migration, and this was something we should all witness, he said. So, we decided to go for it. When we showed up at 6 am on a Saturday morning, we weren’t expecting much. We were definitely surprised to see dozens upon dozens of birding enthusiasts and wildlife photographers with binoculars and mega lenses training their eyes and lenses on anything that twitched, flitted, fluttered or flapped. Maybe these people were on to something. Sure enough. High up in the trees and deep in the bushes, hundreds of tiny warblers flitted about from branch to branch, singing their pretty songs and eliciting oohs and aahs from the admiring crowds. It was quite a scene. 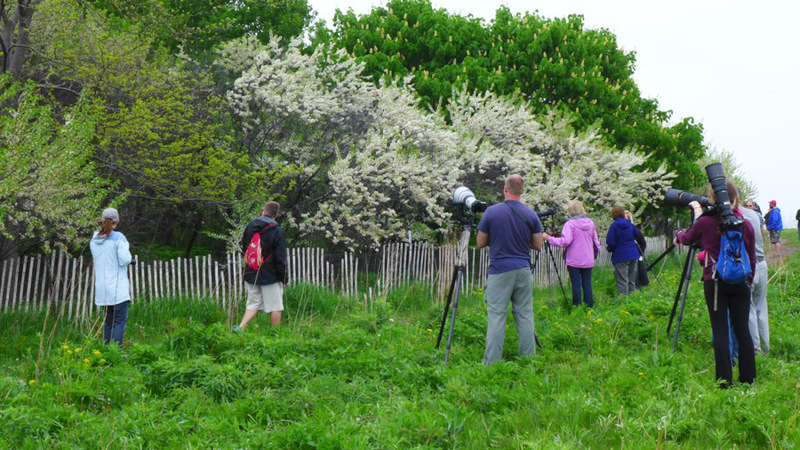 We love photographing birds, but trying to capture warblers through the lens is quite a challenge. They range in size from only about 4-5 inches and are constantly on the move. Most of our avian success stories have been with larger, perching birds who are a bit more accommodating for their photo sessions. 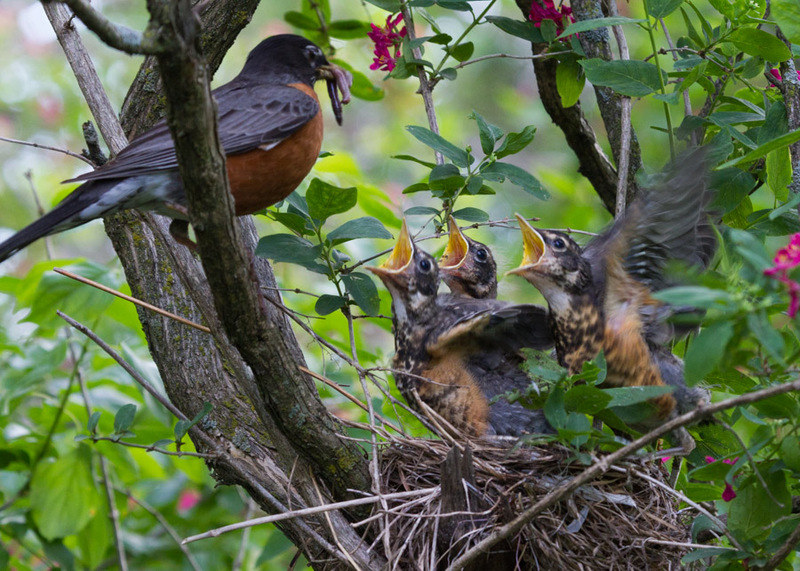 These warblers are on a mission to fuel up on bugs and flowers before continuing the journey north to Michigan, Minnesota, Canada and, in some cases, even Alaska! Let’s just say “sittin’ still” is not in their vocabulary. We set up our tripods, pulled out our longest lenses, focused the binoculars and did our best to fit in with this new cult we had joined. Before long we were clicking away and cursing missed opportunities under our breath as we shot frame after frame of blurry, half out-of-the-frame, just-missed-it shots. Trust us when we say warbler photography is tough! With little success to show from the warblers, we often turned our attention to subjects of the larger and slower moving variety that could be found when wandering about the myriad of trails. Seeing all of these little cuties was a pleasant distraction from our mostly futile attempts at capturing the elusive warblers. 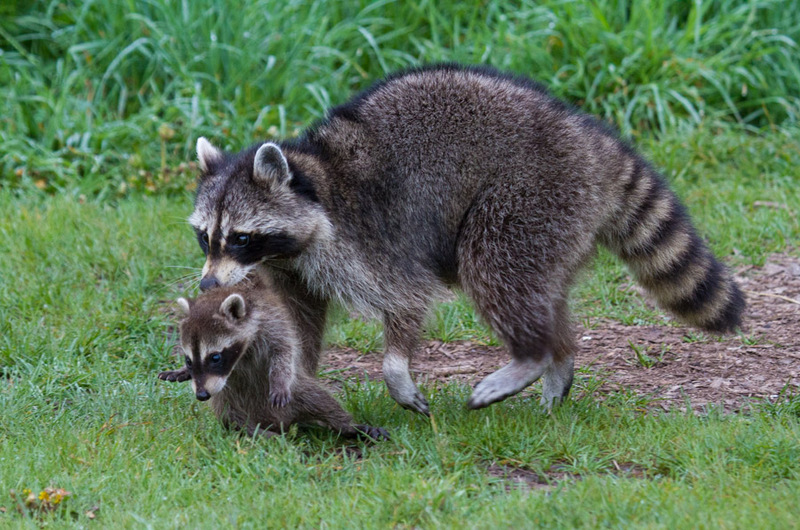 And if the chipmunks, bunnies and goslings weren’t cute enough, we nearly lost it when this Mama Raccoon walked straight towards us with a baby in her mouth! We followed her along the path until she ducked into her new den under the cement path leading out to the pier. May has always been the most popular month for moving in Chicago. Guess that holds true for the animals, too! We even found some beautiful columbine and shooting stars to photograph, too. We were really starting to like this Montrose Point and were absolutely kicking ourselves for not discovering it sooner! In addition to the delightful warblers, we saw all sorts of colorful flyers like the Baltimore oriole, Summer tanager and Indigo bunting. We spotted a few early hummingbirds, common grackles, American goldfinch, cardinals, and even the grey catbird. 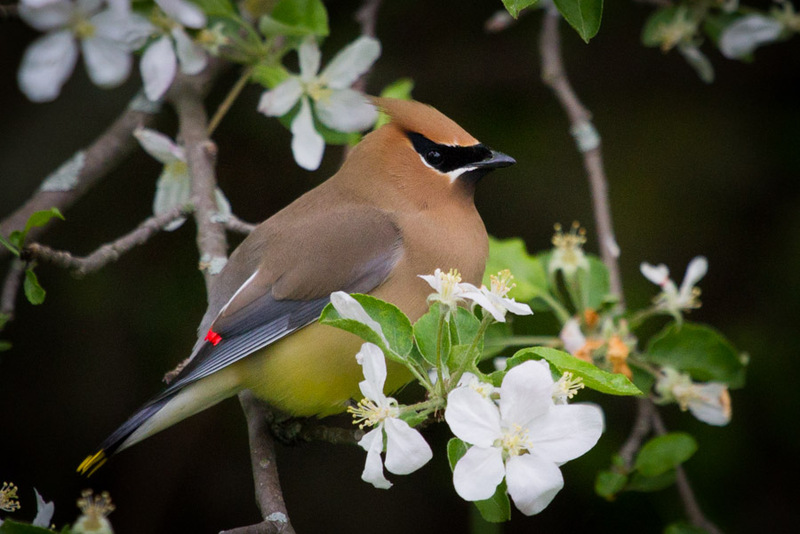 We were excited that we finally got a chance to photograph the striking Cedar waxwing. What a beauty that bird is! Almost everywhere we looked, we saw the ubiquitous Red-winged blackbird. 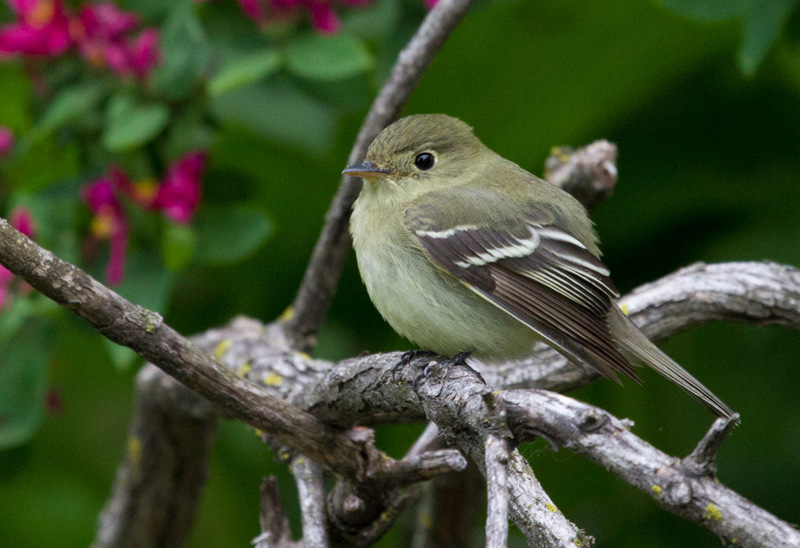 The loud, harsh calls of these bold birds rang out in complete contrast to the melodic songs of the migrant warblers, but their tendency to perch and boldly announce their presence made them an easier target for our slow-focusing lenses. Along the Lake Michigan shoreline, we found interesting migrants like the Willet, Yellowlegs and Spotted sandpiper, as well as the more common gulls. 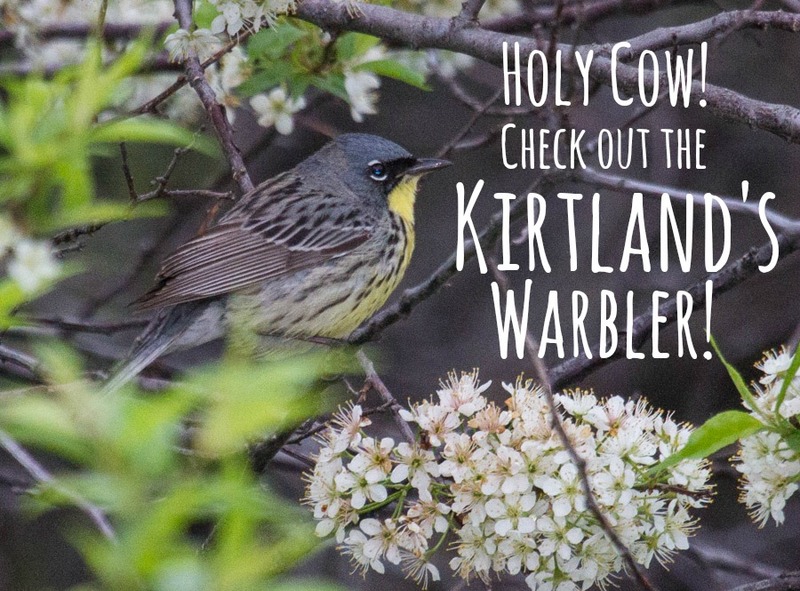 But the real star of the show that had everybody buzzing at Montrose Point on that fateful day was the astonishing appearance of the Kirtland’s warbler. 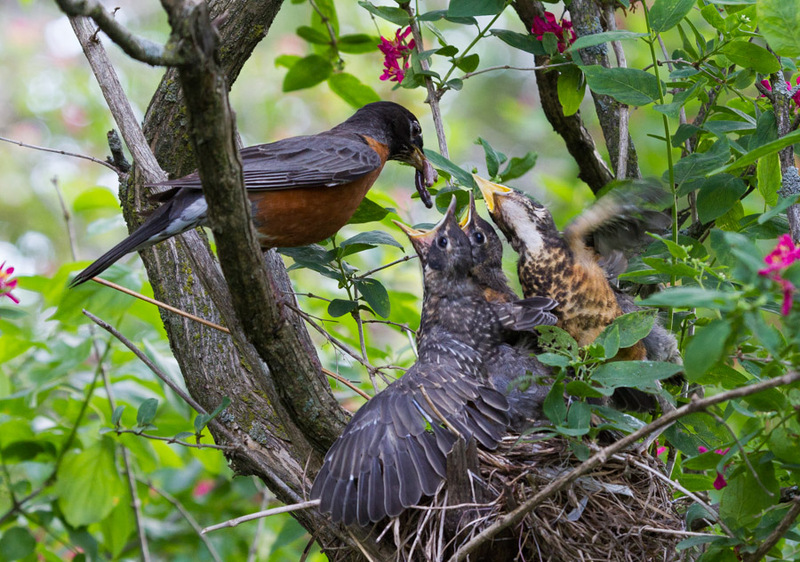 This rare bird (there are under 2000 left) has been on the endangered species list since 1967 and only nests under very particular circumstances in jack pine trees found in central Michigan. This is where we began to really appreciate our new cult as folks banded together to keep an eye on the elusive Kirtland’s as it moved from bush to bush. When other impostors showed up these avid birders would quickly identify the pretender and maintain their vigil. When Mr. Kirtland did appear they would gasp and get real quiet, barely moving a muscle lest they scare him away. 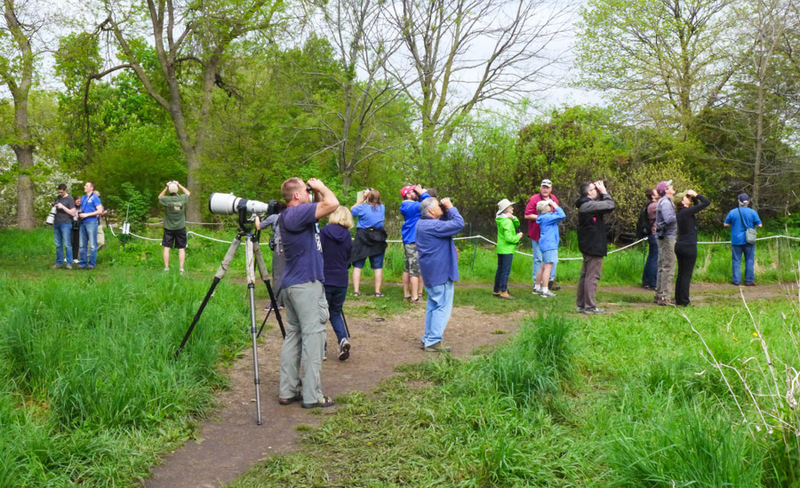 Birders are kind-hearted souls by and large and you would have thought we were witnessing the Second Coming of the Messiah or at the very least a sighting of George Clooney. It was all rather exciting. When the Kirtland’s would disappear into the brush again, everyone stood around grinning and reminiscing about that time they last saw him in the 90’s. We felt like we had stumbled into a once-a-generation event. Don’t believe us? The Kirtland’s appearance was such big news in these parts that it even made the second page of The Chicago Tribune! CAUTION: It turns out birding is almost instantly addictive. We were so jazzed about our success in locating and photographing new, small birds that we returned to Montrose Point again and again over the next two weeks to make the most of this amazing convergence of time, space and nature. We’d wake up early in the morning and stop by for an hour or so on our way to school. It almost felt like we were leading a double life—daring bird photographers in the mornings, totally normal teachers for the rest of the day. Somehow we managed to keep it all under wraps, and only a tight circle of friends knew about our new secret identities. It was really interesting for us to return to Montrose Point so frequently and witness all the subtle changes that happen from day to day. 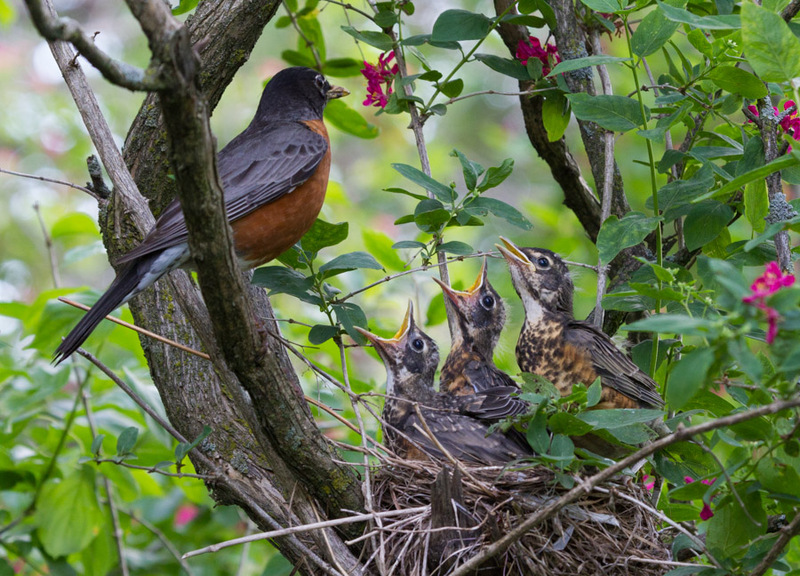 Over this short time span, we watched a pair of robins sit vigil on their nest in a small tree right near the Magic Hedge and raise their three babies up to the point of fledging. How cool is that?!?! And, we didn’t stop there. 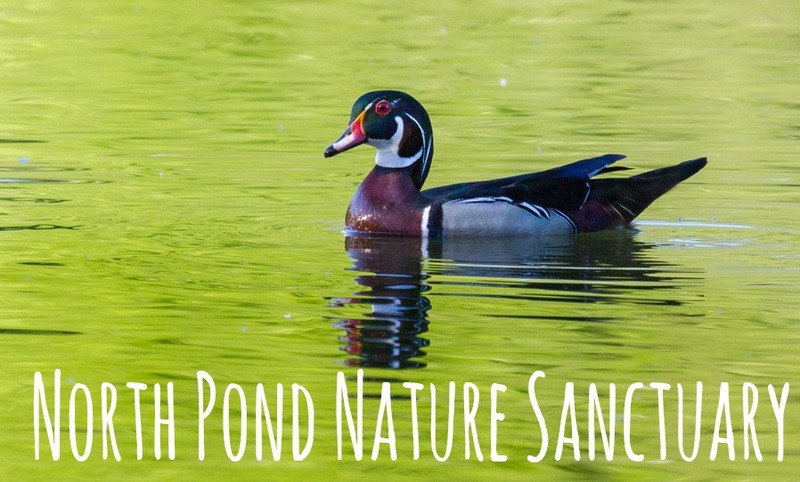 Through the chatter, we kept hearing about the great birding opportunities at the North Pond Nature Sanctuary. Located just a few miles south of Montrose Point on the west side of Lake Shore Drive, this man-made lake was rehabilitated in 1999 and planted with over 150 species of plants native to the Chicago area. Apparently, the diverse habitat attracts over 200 species of resident and migrant birds, although we were a bit too late in the season to catch the warblers here. Nonetheless, on our two short visits to the pond, we were delighted to see a nice variety of birds, including mallards, Canadian geese, a pink-footed goose and the exquisitely-marked wood duck. Perhaps none of these birds are as exciting to see as the migrant warblers, but sometimes even the most common of species can make a delightful photo subject if you just keep your eyes open and give them a chance. 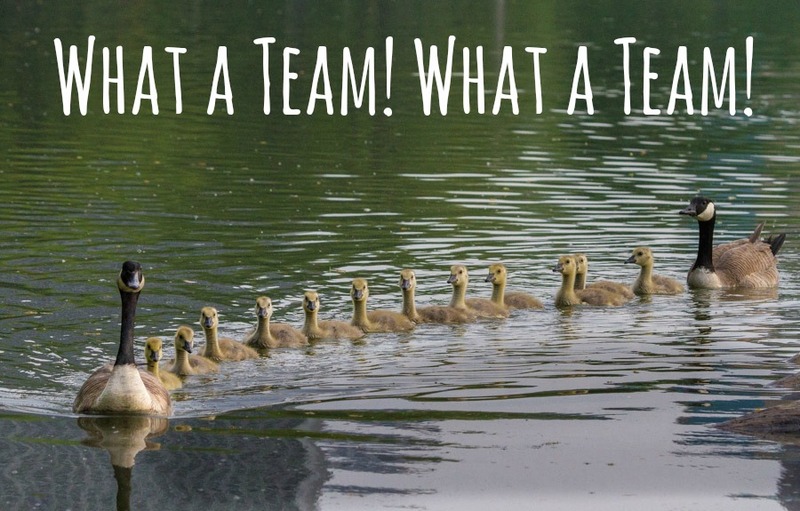 Check out this single-file row of 12—count ’em 12!—goslings. That tight formation is enough to make any kindergarten teacher want to eat his or her heart out. We were also pleased to find two different species of heron on our visits. The statuesque Black-crowned night heron posed quite nicely for us. But we only managed to get close enough to this skittish Green heron when he was thoroughly distracted by the prospect of catching his next meal. You have to admire that focus! With a great view of the Chicago skyline, attractive native landscaping, a popular restaurant and numerous other photographic subjects, North Pond was another terrific find for us. On top of that, we managed to make two additional nature outings before getting struck by Chicago’s migrant madness. 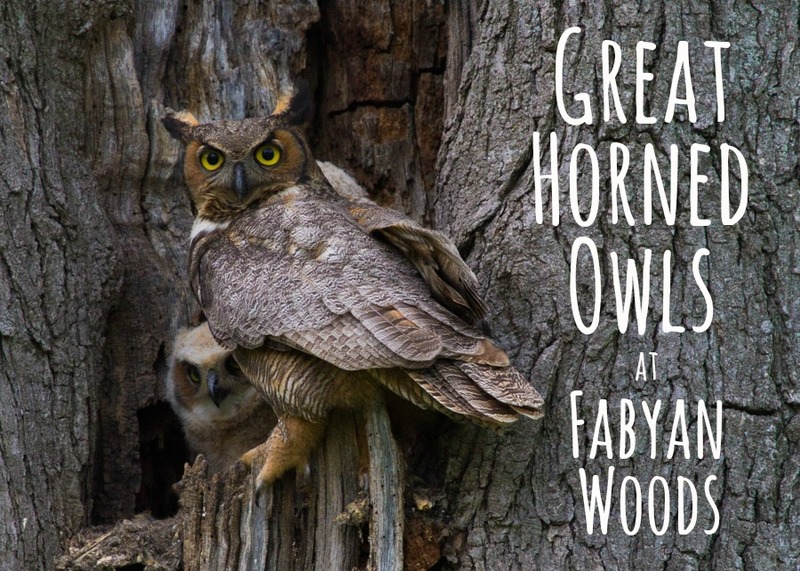 Another camera club tip had us drive 45 miles west of downtown to Fabyan Woods in Geneva, IL, where we were fortunate to see a Great-horned owl nest. Originally, there were three owlets in total, but one had fledged just before we arrived and was high up in a tree not too far from his siblings. 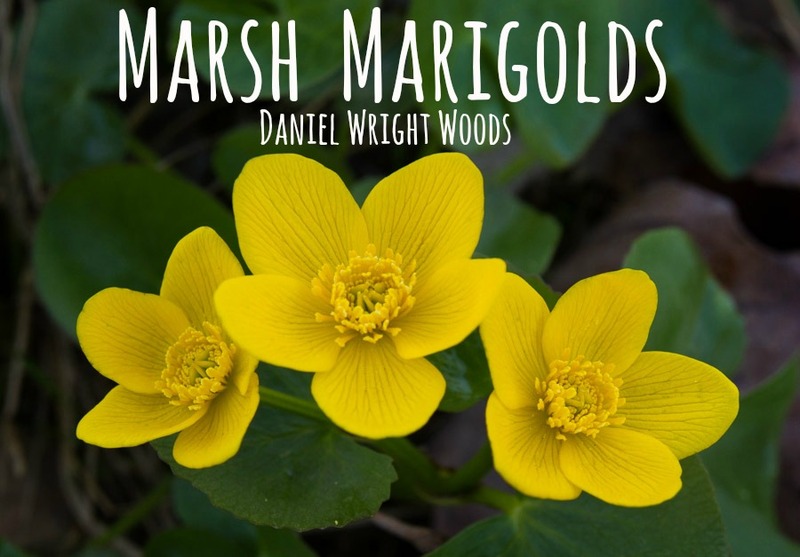 We also ventured 25 miles north up to Daniel Wright Woods in Lincolnshire in early April to check out the marsh marigolds that grow in a swampy area just outside of the forest preserve. These bright yellow blossoms are one of the first signs of spring in Chicago and can make a beautiful close up photograph despite their rather drab and unkempt surroundings. All in all, we had an amazing spring of nature photography—right here in Chicago of all places! Thanks, Lyle. We are really hoping that they will be back again next year! Indeed! And they are so much easier to photograph than those warblers! A glorious post filled with exquisite photographs! A joy to visit your wonderful blog! Thanks so much, Julie! 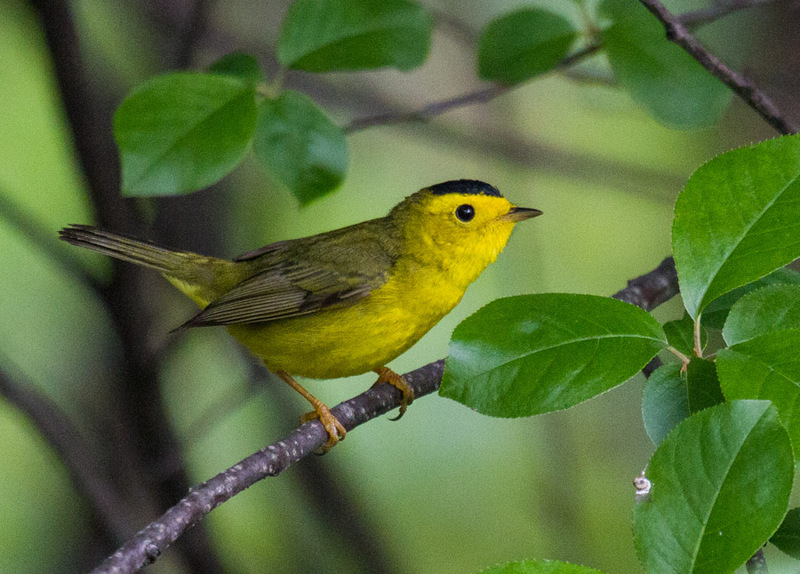 We had a chance to check out your blog, too, and it looks like you have quite a talent for photographing the warblers! We really appreciate you stopping by. Cheers! Thanks, Judy. We are glad you enjoyed seeing these photos from your old hometown (perhaps in a new light)! Hope all is well with you and David! Another terrific post! And it’s about our home town which makes it even better. Thanks, Mike! Of course, you deserve all the credit. If it weren’t for your email, we would have missed it all. We are looking forward to seeing some of your shots soon! Wow, Kathi! Thanks for making our day! Yes, we would love to go on a birding outing with you and Carrie. Do you have any good spots up in your neck of the woods? We’d love to see them with you! Wow! Just fabulous; in every way. What a terrific post; thank you for sharing. I hope you’re both well. Any exciting adventures coming up? Thanks, Jane! We had a lot of fun creating it. We are off to Greece as chaperones on an Ignatius trip and then to the Cordillera Blanca in Peru for two 12-day treks. What are your future travel plans? I’m sure you’ve got something great on the horizon! I am so glad that these pictures were taken where I have walked for exercise. The photos are fantastic! Thanks! We’re happy, too, that we were able to create a post from photos so close to our house. Discovering Montrose Point has made such a difference in getting through the end of the school year. We’ll have to revisit the next time you are in Chicago! Beautiful! And what a coincidence – we have Ladakh and Chicago in common! That is a cool coincidence. I don’t see an “About” page on your blog (or maybe I just missed it). You should consider adding one. It’s fun for new readers to get to know a little bit more about the blog’s author. 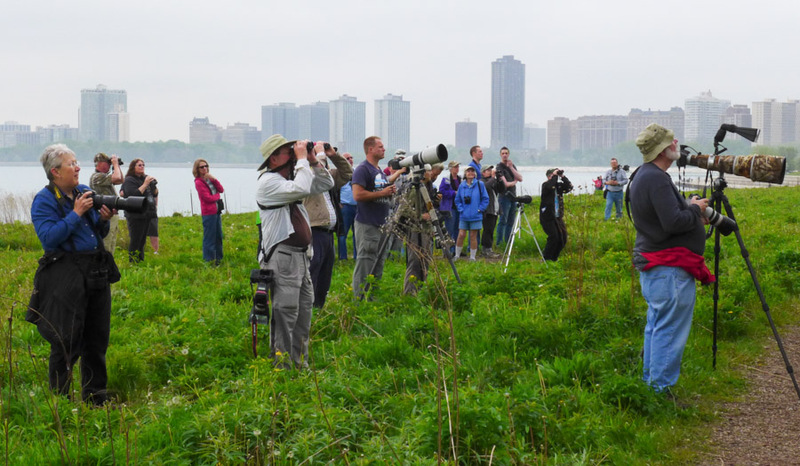 Have you ever been birding in Chicago? Yes, thank you, good idea! I’m just starting out on WordPress and will have to add that in. No, I haven’t been birding, so thank you for your post! Busse Woods is my favorite for sunsets. And recently I observed a spider weaving a web – at sunset – and that was really awesome. Thanks for the tip on Busse Woods. We were there a long time ago, so we’ll have to give it another look sometime soon. I love those spider web shots with the sunlight showing off their beautiful patterns. Welcome to the exciting world of blogging. I look forward to reading more of your posts!